Table 28: The rate of interest of Travel Loan offered by Different Banks. HSBC offer a higher interest rate of 18% regarding Travel loan. Eastern Bank Limited and Dhaka Bank Limited offer the same interest rate of 16%. 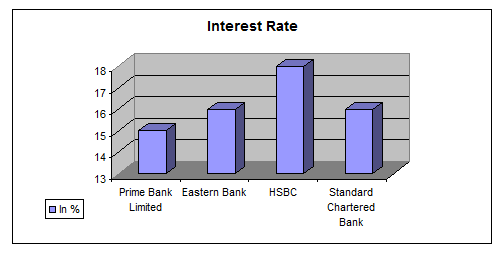 Prime Bank’s interest rate is competitive with compare to other three banks with 15%. Table 29: Down payment of different banks on Travel loan. No down payment is required for the three Banks i.e. HSBC, Eastern Bank Limited and Dhaka Bank Limited. But Prime Bank Limited charges a Down payment of 10% of loan disbursed. Table 30: Maximum time required to repay the loan of travel. Figure: A comparison on time limit offered by various bank on Travel loan. A client can apply for a maximum period of five years to repay his loan if he wants to obtain a loan from eastern bank limited or Dhaka Bank Limited. But in case of Prime Bank it three years and in case of HSBC it is four years. HSBC and Eastern Bank Limited do not charges any application fee to obtain their loan. The application fee is highest for Dhaka Bank Limited (BDT 500). Prime Bank Limited charges an application fee of BDT 10. Table 32: service and other charges of different banks regarding Travel loan. HSBC charges a service charge of BDT 1000 while prime Bank Limited, Eastern Bank Limited and Dhaka Bank Limited demand a service charge of 1% of the loan. No Bank penalizes for late payment of installment other than Dhaka Bank (BDT 200). Risk fund is 1% of the loan for Prime Bank and Dhaka Bank while no risk fund for other two Banks. In Prime Bank Ltd. the practice of Management Information System is just at the beginning stage. The Bank has equipped all units of it with modern technology such as Computer Network, Telex, fax, SWIFT & e-mail etc. Bank has also launched a Web Page of its own. The bank is using Local Area Network at branch level. It also using a database named PC Bank for data collection, processing, storing and disseminating information to support decision-making, coordination, control. At the branch level the bank is using a local area network of Peer-to-Peer architecture. It is a distributed network through which all the work stations can exchange data by direct access and can share peripheral devices such as printers, without going through separate server. At every branch a central database is maintained for collecting storing processing, retrieving, banking transactions. This central database is maintained by using application software named “PC Bank” developed by Leads Corporation limited Bangladesh. Using this database employees can inform account holders their account balance, periodic transaction for a certain period, any transaction relative to account holders’ deposit, withdrawal of money, Loan proceeded to party’s’ account, T.T payable /Issue, D.D, new account opening, etc. promptly and accurately. Data related to daily bank transactions are posted to PC Bank daily from Remittance, Cash & Deposit, Credit & Advance and Foreign Exchange section maintaining different password, which are being updated at server. When a customer avail for a loan, at first he/she needs to collect application form along with other papers. After completing the application form the customer submits it to bank. A management body approves the loan if the customer meets all the requirements. The loan disbursement and every repayment of installment are posted to the database of bank named PC bank. Overdue of installments, accrued interest and all other necessary information are calculated and maintained through the software of the bank automatically once they are posted. The customers can know their transaction status within few seconds at any time of banking hour through personal visit or a phone call. In case of any mismatch the customer is provided with printed statements of their transaction status. Thus it facilitates the customers with prompt and quality services at the low cost of personnel labor from the bank. But the shortage of computers at the consumer credit department is making some problems for providing prompt and quality service. Though Prime bank is at better position in case of providing services at CCS department and use of technology, some other private banks like Standard Chartered Bank, HSBC, Dhaka Bank are at better position in case of use of technologies and data processing. Standard Chartered Bank provides fully automated services through a powerful database and software maintained directly from Channi of India. Dhaka Bank Limited Provides customers with online transaction facilities. I found the website of HSBC more attractive and resourceful than Prime bank in case of consumer credit division. Prime bank Limited needs to develop itself in the above mentioned divisions to be competitive. CCS has a good relationship with its clients. As a result of such service it has currently more than 9, 95, 297 customers highest in the private sector commercial Bank of our country. CCS department has quality human resources. All officers are qualified and efficient and it makes its position stronger. The asset of PBL is of very high quality. The major portion this asset is loan and advances. The default rate of PBL is 1.54% whereas the average default in Bangladesh is 30%. This proves that the credit risk of CCS very low. The working environment of CCS department is very friendly and co-operative.There is no senior, junior, boss, employee and internee relationship all treated in the same way and mane reason of this department is its friendly environment. One of the major weakness of CCS department is the technology used by the Bank. There is no enough computers, telephones or fax machine in this department which often slower the pace of work. The pay scale of employees in PBL is not competitive compared to other private banks of the country. The employees of PBL get compensation of around 60% of what other private banks for example Dhaka Bank, Southeast Bank etc offer to their employees. When an employee gets a promotion to the next level, he/she gets more compensation CCS department is regular in giving promotion, but the employees get late effect of this promotion. As CCs has trained human resource and proficient recruit, which will result in utmost output it properly utilized. CCS department is growing very quickly. PBL is only bank that provide loan to low income people which cannot think HSBC or Standard Chartered Bank. Providing quality service is one of the major goals of PBL. To increase more operational efficiency in respect CCS,CCS activities will be more dynamic which can easily grab the market. The political unrest as well as the law and order situation of Bangladesh is always a threat for banking industry. The current economic situation is very likely to get worse further. In this case, the whole banking industry is facing a big threat. Competition is always a major threat for any organization. In recent Years, the number of private bank is increasing. These bank always pose a threat for others by coming up with new product line, innovative technology, quality services etc. Thus the level of competition rises and creates threat for CCS department. 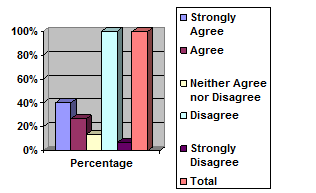 The Research divides the questionnaire at three parts. The questionnaire is divided for the Consumer of Prime Bank as well as the Employee of the prime Bank. Those two parts provides clear ideas about the needs of the customer and the Employee from the Bank; the preference of the Credit holders from the Bank. To conduct the analysis each statement is assigned a numeric score, ranging 1 to 5. I conduct the analysis, on the Item by item basis. 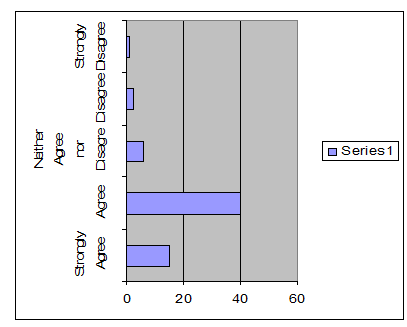 The total of respondent is 15. 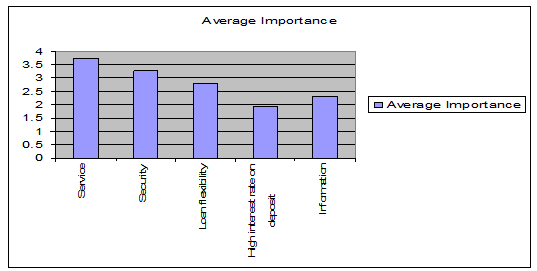 The Average respondents rating for each item is calculated. Multiple choice questions will be count as frequency. 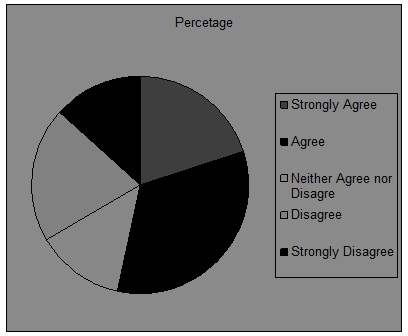 Then the Mean of the respondents will be counted. Rank orders the data according the Preference of Customers from the Bank. From the Data set it can be recognized that, customers will give highest preference on the service of the Bank, then security. After that, they choose the flexibility of Loan. But the lowest preference of customers on the higher interest rate on deposit. Overall Judgment of the credit performance of Prime Bank goes towards the good Performance of Prime Bank. Credit facilities of Prime bank are acceptable to the Customers. The customers have concerned on the service and loan flexibility. So, prime Banks need to hold the present position,. The down payment paid by CCS customers is very high with PBL. Besides, others bank such as- Dhaka Bank Limited, AB bank Limited, And Eastern Bank Limited are not taking any down payment. So I think PBL should not take any down payment or reduce the down payment percentage to make its CCS more competitive. Interest rate and payback period are very important criteria for any kind of loan but most of the clients are not satisfied to PBL Consumer Credit interest rate and loan payment period. They want lower interest rate and more payment period. Due to the present Government and Bangladesh Bank monetary policy for controlling inflationary rate it is not possible for PBL to reduce interest rate. Therefore I suggest for increasing payment period. It will make the installment more attractive and convenient for customers to pay. At the same time it will help reduce outstanding for the bank. According to CCS policy of Prime Bank Limited that loan processing time will not exceed more than 7 days but in reality it takes more than that. So the authority should care about it for their reputation. Another important thing I was found from my study that applicants of CCS who are working in same organization, working at same position, getting almost same salary and guarantors are also same or working in different organization but there status is same but they are not getting the same amount of loan. So there may have biasness or misjudgment. I think the authority needs to be more professional in doing their duties that may play a great role in reducing their rate of outstanding. Every year CCS offering Bank’s disbursement increasing, which shows its popularity and its recovery rate is also good. So it is profitable for banks as well. But it is very unusual that many people who have the ability to able the loan even do not know about CCS. So PBL should take this chance to attract those people by using different advertising media to their CCS product. PBL should include more differentiate product in their CCS, such as – Teacher Loan, Shop Financing Scheme, Personal Loan for Women etc. to gain competitive advantage. Prime Bank should update its software as early as possible to start online banking transaction for more customer satisfaction. Prime Bank should ensure adequate supply of modern technological instrument, such as, computers, access to Internet. Prime Bank should arrange regular training on technological changes for its employees to be familiar with modern technological changes so that they can take it as a challenge to convert technological changes into organizational advancement. Almost all the branches of the bank are situated on the city areas. Though the use of Internet in our country is not as large as should be in the age of Information Technology, the use of Internet is increasing in the city areas to satisfactorily. Prime Bank can target its website as an important medium of advertisement for consumer credit products. Therefore should regularly update its website. Prime Bank may also go for online application procedure for its consumer credit loan that may reduce many paperwork, duplicity of work, and harassment of employees significantly. The bank may also establish online tracking of customers’ creditworthiness through software. This kind of tracking will help to grade the customers by analyzing past records. It will help identify the creditworthiness of customers who have availed themselves for the second time or afterwards. It may happen that for transfer of one officer the new officer in charge may sanction a loan to a person of worse credit rating for his/her ignorant about the customer. Therefore initiation of such kind of application helps management taking better decision undoubtedly. Banks play a very vital role in the economic development of the country. The popularity of banks is increasing day by day which leads to increase competition as well. Currently 52 Banks are operating in Bangladesh. All the Commercial banks are offering almost the same products and services and almost same their operation system. But the ways they provide the services are different from each other. So people choose their Bank according to their satisfaction and need. And they will prefer the bank of which service is easily accessible and understandable. One the other hand, Bank innovate new products and services to attract their desired customers. Prime Bank also has different types of Credit Program. Consumer Credit Scheme is one of innovative program of PBL and this program is very much popular for its easy accessibility and easy procedures. Since the popularity of this scheme is increasing day by day, Prime Bank take it as a challenge to become a leader of CCS through innovative and the use of above mentioned recommendations. The management of the bank has decided to install up to date software at a cost of around TK. 30 crore. The management at the Prime Bank Sat Mosjid Road Branch also decided to furnish the Consumer Credit with necessary instruments. I think with the exhaustion of new technological advancements Prime Bank preserves the right be the leader of Consumer Credit Scheme in the banking industry in Bangladesh and would be in the near future.